Went to Syracuse over the weekend. Mom’s FAVORITE meal is Chicken Riggies. We went to Nestico’s, a restaurant in North Syracuse and she was able to get her Chicken Riggies. Mom and I had a nice conversation and enjoyed our lunch together. Kent and I got back yesterday. I was loading up my photos and saw this one; Reminded me of our lunch together. I took this photo to send to Eric while we were eating lunch. She hates to have her picture taken but she sure looks smug about her Chicken Riggies! I had a meatball sandwich. I still can’t find a restaurant that makes meatballs as good as mine. 😉 I decided to make some Chicken Riggies for my lunch tomorrow. I updated my recipe and this one is a winner. (By the way, I didn’t have any Rigatoni so I ended up using Mostaciolli.) Martin and Sean had some tonight and really enjoyed this Central New York, local Italian pasta dish. Hope you will give it a try! MARINATE CHICKEN Combine chicken, 3 tablespoons cherry pepper brine, 1 tablespoon oil, and 1 teaspoon salt in zipper-lock bag and refrigerate 30 minutes or up to 1 hour. Heat 2 tablespoon olive oil in Dutch oven over medium-high heat, add chicken. Cook until chicken is browned, 4-5 minutes. Remove from Dutch oven and set aside. In Dutch oven add 4 Tablespoons butter. When butter is melted, add onions, roasted red and green bell peppers, 1 teaspoon salt and saute until onions are translucent, about 6-8 minutes Add garlic and stir into vegetables. Add tomatoes, chicken, hot cherry peppers, and 1/2 teaspoon pepper and bring to boil. Crush the tomatoes. (You could crush with your hands before adding to pot). Reduce heat to medium low and simmer, stirring occasionally, until sauce is thickened, 10 to 15 minutes. Meanwhile, bring 4 quarts water to boil in large pot. Add 1 tablespoon salt and pasta and cook until al dente. Reserve 1/2 cup cooking water. Drain pasta and return to pot. Add rigatoni to the sauce, add cheese and toss to combine, adding reserved pasta water as needed. Season with salt and pepper. Serve. Now is that Simple and Delicious?! I would say so!! Buon Appetito!! 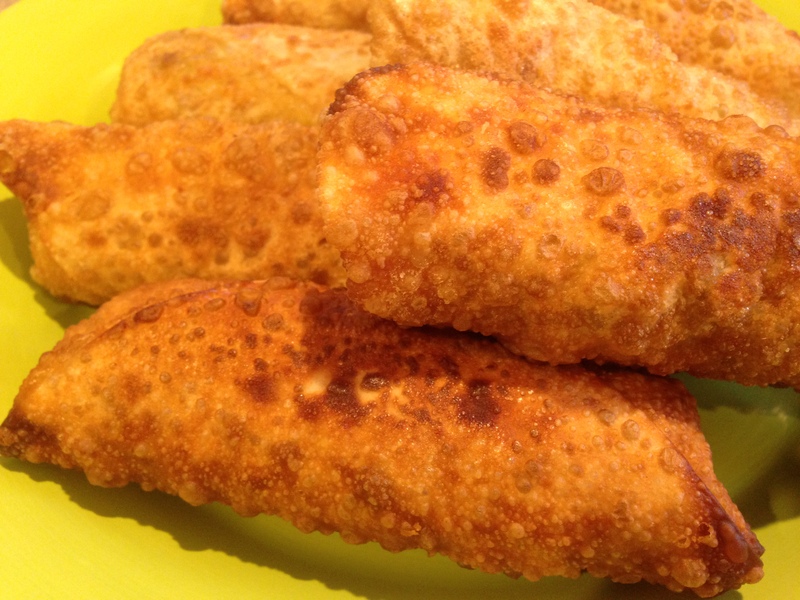 Our entire family love these egg rolls. They take time to make but they are totally worth it. You just have to get everything chopped and measured out before starting that frying pan. Once you do that, it takes no time. Updated the recipe to our family liking. It seems the more I do a recipe there are changes I make that work for us. This truly is simple and delicious! 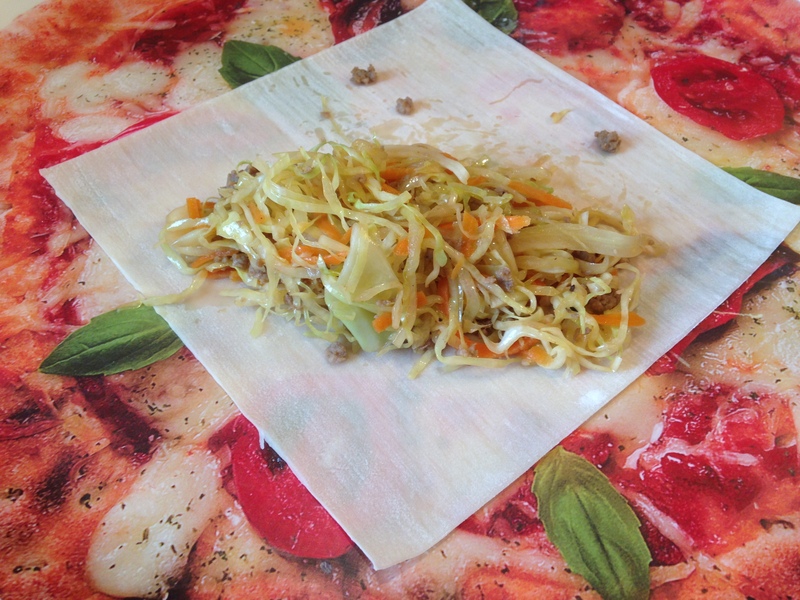 I used Spring Roll Wrappers. You can get them in the produce department of your grocery store. Room temperature is best. Marinate the ground pork with the soy sauce, cornstarch, sugar and sesame oil for at least 10 minutes (or longer if you want). In the meantime, shred the cabbage and the carrots. 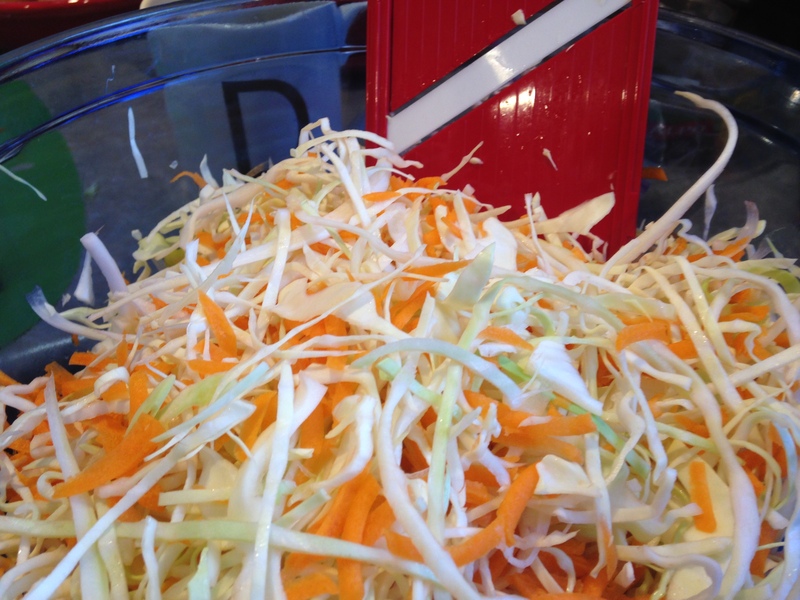 I used a mandoline to shred the cabbage and my grater for the carrots. You could use a food processor too. Whatever works for you! Heat a wok or large frying pan over high heat until hot. Add the cooking oil and swirl to coat. Add the garlic and ginger, fry until fragrant. Add the pork and fry until no longer pink. 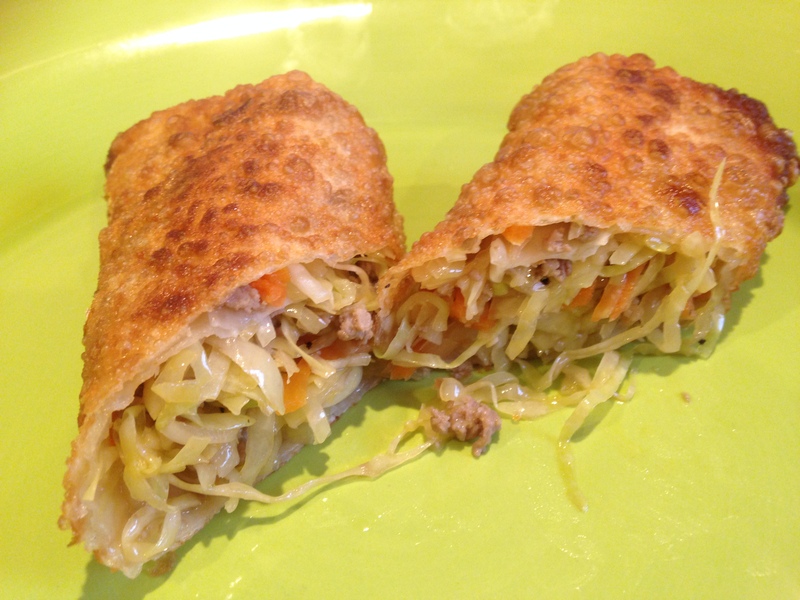 Add the cabbage & carrots and stir fry for 1-2 minutes, until vegetables are softened. Add the rice wine, soy sauce, sesame oil, salt and pepper. Continue to stir fry for 1-2 minutes. Remove filling to a rimmed baking sheet and spread to cool. Set up so juices can drain to one end of the cookie sheet. Let cool for at least 15 minutes. Remove all the juices. Now, let’s wrap! With the point of the wrap, pointing away from you, place 1/4-1/2 cup of the mixture in center of the lower edge of the wrapper. (I use 1/2 cup – we like them a little larger. It works great) rub point edges with the slurry and complete rolling to tip. Deep fry in the oil of your choice in large frying pan or Dutch oven until golden brown.